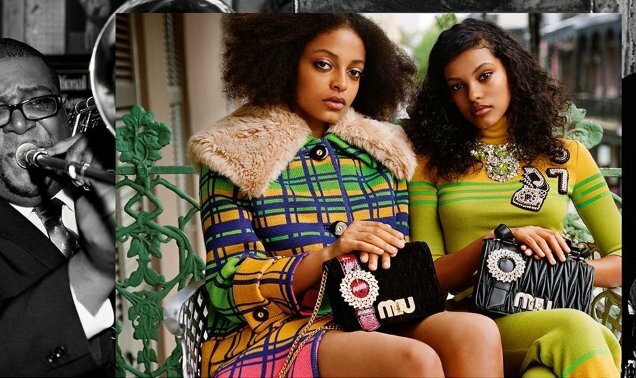 While Miuccia Prada is currently shaking up Prada’s various advertising campaign concepts, she’s also taking Miu Miu in a whole new direction, this time transporting us to Mississippi. British photographer Alasdair McLellan and stylist Katie Grand reunite for the Fall 2017 campaign, along with a diverse star-studded cast including Naomie Harris, Kate Moss, Jean Campbell, Jasmine Daniels, Eliza Cummings, sisters Adwoa and Kewesha Aboah, and more. Our forum members weren’t feeling the new campaign, however. “The concept is becoming really old and tired now. Also, Miu Miu is not a British brand even though Alasdair and Katie [Grand] clearly would like it to be,” pointed out anlabe32. “This campaign is a flop! Every single campaign since Katie and Alasdair started has been spectacular. Was the team asleep? Did they let the models play stylist and photographer? The sets look very generic and poorly lit. The styling is bad,” slammed GivenchyHomme. “What a mess!” added KissMiss. Kewkaw really hated the campaign. “I wanna vomit. They look restless and like death to me. I needed a vibrant color scheme for Miu Miu,” she exclaimed. “McLellan is a hack, not surprised by the insipid results,” HeatherAnne commented. RedSmokeRise wasn’t here for the changes either. “There’s nothing Miu Miu about this campaign, unfortunately. Identity crisis here, along with those snoozefest campaigns over at Prada. Miuccia needs to get her act together,” he stated. “Looks like s***,” fumed YohjiAddict. “This is so cheap and is more Mulberry than Miu Miu, also I miss how this brand used to have different photographers almost every season at least if they were going to have only one photographer they should have chosen Inez & Vinoodh, they perfectly understood the brand,” he said. Check out Miu Miu’s Fall 2017 advertising campaign in full and share your opinion with us here.